The newest entry in the "KINGDOM HEARTS" series, "KINGDOM HEARTS III", released worldwide on 1/29! 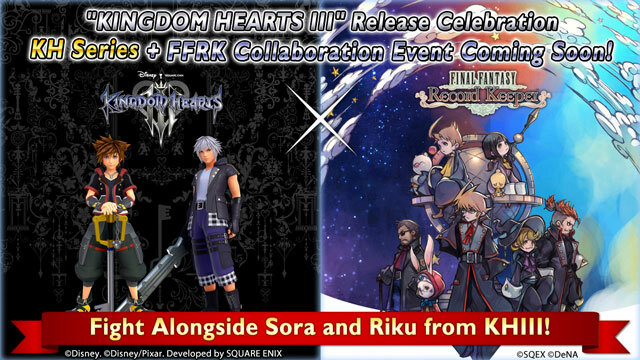 To celebrate this release, FFRK will have a collaboration with the "KINGDOM HEARTS" series! The collab event starts at 5:00 PM 2/20 PST(1:00 AM 2/21 UTC)! Details about the collaboration will come via FFRK's in-game notifications and official social media accounts. Please see the official site for details on "KINGDOM HEARTS III." FINAL FANTASY Record Keeper is available as a free download on the App Store for iPhone, iPad and iPod Touch and on Google Play for Android devices.